The second item is also a new Twitter capability. You can now update your Facebook status directly from the Twitter client of your choice. application within Facebook. Wouldn't it be nice if Facebook allowed you to update your status from outside of Facebook from the client of your choice: e.g. Twitterific or even MoodBlast? Regardless, only having to update your status in one place is a positive. This is a huge deal as it is the first time that Facebook has allowed you to do something inside Facebook without having to be in Facebook. Progress!!! Before this will work you need to make some changes to enable this through the Twitter application in Facebook. UPDATE: This has gone through several edits. Originally I had it written the way it reads now. I couldn't get it to work from outside, but it worked just fine from the Twitter application within Facebook. I tried several times. Well, it does indeed actually work. Perhaps there was some lag from so many people trying it out shortly after it was announced? Regardless, this is wonderful. Is this an early sign that Facebook might be willing to open-up? The next item relates to rumors that there is a Facebook instant messaging application coming late this week. 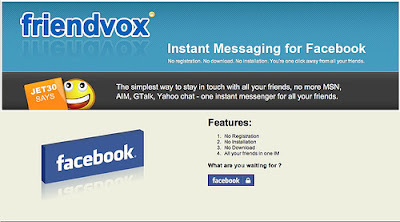 The biggest, and still unconfirmed part of this rumor is that the Facebook client is supposed to talk XMPP. This could be just what we need to bury forever the proprietary chat formats of AOL, MSM, and Yahoo. We desperately need a unified chat protocol, and if Facebook can help make this happen it's a positive. The new client is supposed to work completely in a browser, no client download, and even work outside of Facebook. Besides messaging, it is will have several features to allow you to manage other Facebook communications -- like updating your status. Finally, the application's release was delayed a week for no apparent reason? Could they be rushing to add the rumored Facebook groups before release? Makes total sense to me. 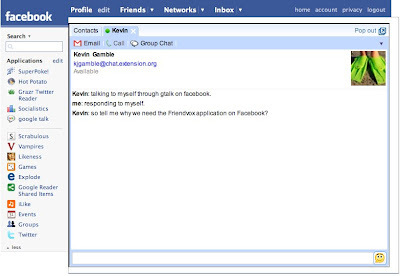 Finally, and this is not new, but I just wondered how many people were aware that there is a very capable XMPP chat application already in Facebook? Yep, there's a sweet GTalk implementation that you could be using right now. Here's a capture of me chatting with myself. Sweet! There is soapbox.net 's - a coversant client - facebook application, which is, in fact, a clever hack above XMPP - it uses a third party xmpp server - hosted by coversant - and uses the fact that an xmpp server can authenticate from anything - this time, facebook. There are other IM things as well, most of them use XMPP, because it's the only viable standard. Whether Facebook will support it officially - looking at clues like open ports, srv records, testing domainnames - there's no sign of it yet.